Consumer Intelligence Research Partners (CIRP) released analysis of Amazon Prime and Amazon Visa affinity programs from Amazon, Inc. (NASDAQ:AMZN). This analysis indicates that Amazon Prime members are almost as productive for Amazon as Amazon Visa cardholders, spending almost as much per year. CIRP surveyed U.S. customers of Amazon.com from the three-month period ending November 15, 2013. Based on the survey data, we estimate that Amazon Visa cardholders spend $1,530 per year, and Amazon Prime members spend almost as much, at $1,340 per year. Customers in neither group spend only $650 per year. Retailers compete fiercely to get their branded credit cards in customers' hands. Amazon plays this game well, successfully offering an Amazon Visa credit card. Yet, Amazon has a secret weapon in Amazon Prime -- these customers are almost as productive for Amazon. Even better, Amazon gains this loyalty, and productivity, without needing to displace another credit card in a consumer's wallet. Amazon has reached almost half of its U.S. customers with its Amazon Prime and Amazon Visa affinity programs (see chart). Based on these shares, we estimate that Amazon has 16.7 million Amazon Prime members and 7.3 million Amazon Visa cardholders as of September 30, 2013. It appears that the Amazon Prime program has grown somewhat faster than the Amazon Visa program. Amazon began offering its branded Visa card in 2002, and started Amazon Prime in 2005. In three fewer years, Amazon Prime has grown to twice the size of the Amazon Visa program. 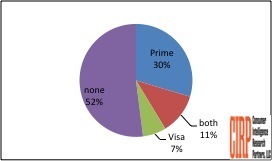 Amazon Prime members and Amazon Visa cardholders visit Amazon.com much more often than other customers. 63 percent of Amazon Prime members and 66 percent of Amazon Visa cardholders visit Amazon more than once a month, compared to 28 percent of other customers (see chart). Based on these distributions, we estimate that Amazon Prime members buy from Amazon 22.5 times per year, while Amazon Visa cardholders buy 24.1 times per year. Other customers buy only 13.9 times per year. CIRP based these findings on its survey of 300 subjects who made a purchase at Amazon.com in the three-month period ending November 15, 2013. For further information, please contact CIRP.